Bellacina by Casey Key, located in Nokomis, is one of the best-selling developments of national builder Taylor Morrison. Its market success is largely due to the Esplanade active adult lifestyle concept that this Scottsdale, Arizona-based builder has again employed in this community. As a result, this development has turned out as a fast-rising search destination for Sarasota homes for sale in South County. So appreciable is the market absorption of Bellacina homes for sale that Taylor Morrison in late 2017 began pursuit of adding 13.5 acres to this community’s original 165 acres. In this expansion move, the builder is likewise seeking a rezoning to allow more home density in the additional acreage. If approved, this plan could add up to 60 more units to the current 302 Bellacina residences. Sales at Bellacina began in early 2016, with Taylor Morrison offering a selection of single-family homes and detached villas. The high salability of these residences owes much to Bellacina’s prime location. Its primary access is State Road 681 near where this highway begins at an interchange with U.S. 41 and State Road 45. Mission Valley Golf & Country Club and Calusa Lakes Golf Club border Bellacina towards east. This setting is a perfect complement to the adult active lifestyle in Bellacina which weaves around lush and mature trees, a serene lake, and nature preserves. An amenity center teeming with resort-type facilities is one magnet to prospective buyers of Bellacina homes for sale. This community hub provides a catering kitchen, gathering room, library and a gym with modern fitness equipment. 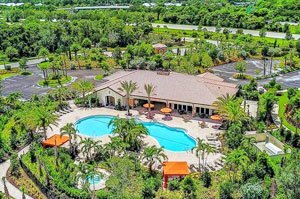 The center’s facilities for outdoor activities include a heated lagoon pool and spa, lighted bocce ball and tennis courts, adventure isle, kayak launch, a dog park, a fire pit and a community park. A full-time lifestyle manager onsite plans and coordinates special events and community activities for residents. The floor plans of Bellacina by Casey Key homes for sale range between 1,600 and 3,200 square feet under air. Villas, typically with two bedrooms within floor areas of 1,689 square feet, are priced in the low $300s. The asking prices level up to the $500s‒$600s range for single family homes with floor plans of over 2,000 square feet designed with three bedrooms and three baths plus a half-bath. All of Taylor Morrison’s builds notably follow high construction standards developed in this company’s over 100 years of industry experience. Bellacina homes for sale likewise showcase Taylor Morrison’s well-thought designer touches that has earned for this builder the title America’s Most Trusted™® Home Builder for two consecutive years. Add all these up to the many plus points of the community’s location, and Bellacina homes for sale are truly market winners. The 10-mile-plus recreational Legacy Trail that stretches between Sarasota and Venice and cuts through the eastern periphery of this community offers a carless route for running and biking. The area’s amazing Gulf Coast beaches, including those in Casey Key, Venice Island, and Siesta Key, are easily accessible too from Bellacina. 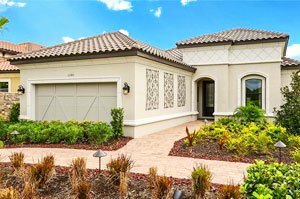 Similarly, trips are as easy and convenient to Sarasota’s life and leisure centers as well as local schools, cultural hubs and healthcare facilities that all make Bellacina homes for sale a wise choice for prospective buyers. 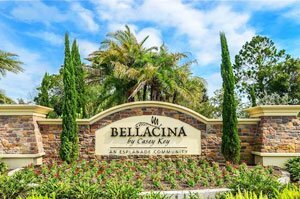 Below are the current real estate listings available at Bellacina by Casey Key.